The 33rd SMA / OLA Pilgrimage to Knock was celebrated on a mild Saturday at the end of May 2013. Fr John Dunne SMA and Sr Mary Crowley OLA led the large number of Sisters, priests and lay people who gathered to honour Our Blessed Lady and to invoke her intercession for their particular needs. The Pilgrimage was on the ninth and final day of the SMA National Novena in honour of Our Lady and despite the absence of sun, and very little rain, the day overall was adjudged a success by all. Bishop Kieran O’Reilly of Killaloe, a former SMA Superior General, preached at the Mass which was led by the SMA Provincial Leader, Fr John Dunne SMA. The multicultural choir was led by Sr Marie Dunne; the Gospel Procession was animated by the students from the International Formation programme at Loreto House, Dublin and the Mary Baxter School of Irish Dancing enlivened the Offertory procession. 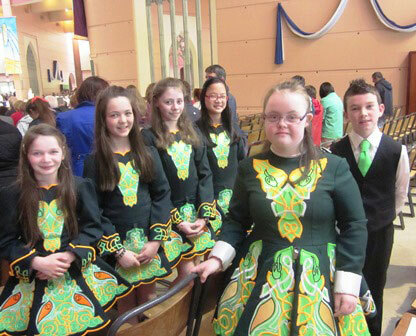 Our picture shows some of the dancers from Omagh. To see some of the Mass click on YouTube. There are two Reports and photos of the event.